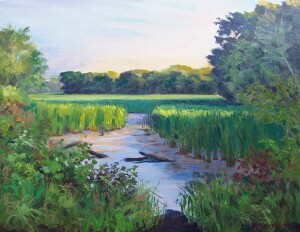 “Sunrise On Minnehaha Creek” by artist Bob Matheson, Oil. The FrameWorks Gallery is pleased to present, “3 Bobs” at 2022A Ford Parkway, St. Paul, MN 55116. The exhibition features three artists: Bob Bonawitz, Bob Matheson and Bob Upton, who are all local Plein Air oil painters. The show will have paintings of Minnesota, as well as, work from their travels. The exhibition will also include supporting artists: Kairong Liu, Rita Corrigan, Ryan Rogers, Kristine Fretheim, Roger Junk, Christina Habibi, Gregory McDaniels, and Aaron Putt. The show will open with a reception and a chance to meet many of the artists on April 26, from 7 to 9 p.m. The reception is free and open to the public. For more information call 651-698-3372 or visit www.frameworksmn.com.